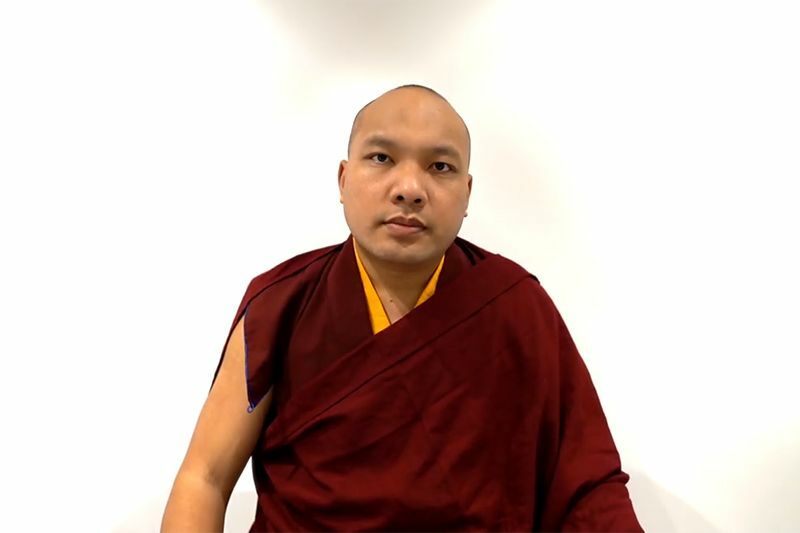 In the first part of the afternoon session, His Eminence Kyabje the10th Sangye Nyenpa Rinpoche recapped and added to his commentary from the morning session. He began with the salutation to Vajradakini, the basis of all attainment—the ground, the path and the fruition—the embodiment of inconceivable transcendent wisdom and symbol of emptiness. Rinpoche then emphasised once more the importance of the guru-student relationship and the necessary qualities of the student on the mahāmudrā path. You who are fortunate, take this to heart. 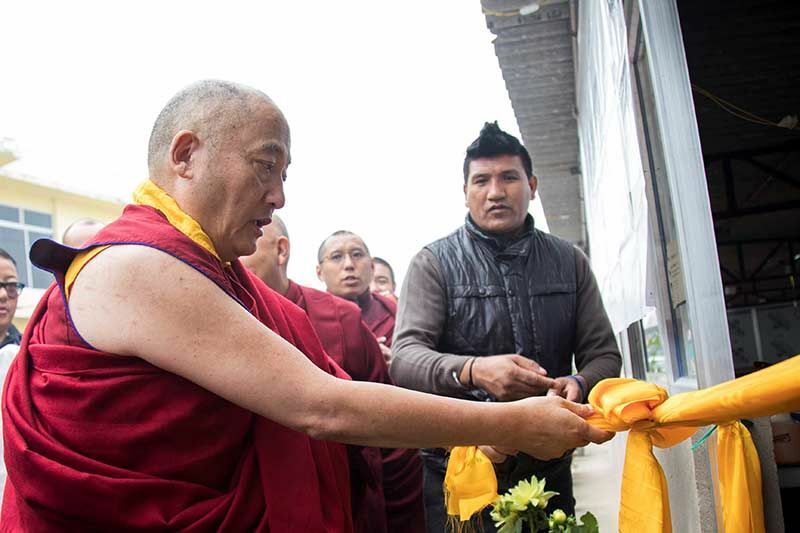 Rinpoche explained that when teaching the profound nature, for there to be some benefit, there should be a profound connection between teacher and student, through the compassion of the teacher and the devotion of the student. Otherwise, the blessings of the lineage would go to waste. The student should not be someone merely interested in the Dharma but someone who, having had a connection with the Dharma in previous lifetimes, could give an uncompromised commitment to the teachings and hold a long-term view of Dharma practice. They needed the determination to continue to practise in future lifetimes, enduring hardship and suffering where necessary. Having understood impermanence and knowing that death is certain, though the time of death is uncertain, the student should be highly focused on Dharma practice, realising that it would be foolish to procrastinate. In addition they should have developed a deep revulsion towards samsara which provides the motivation to liberate themselves. 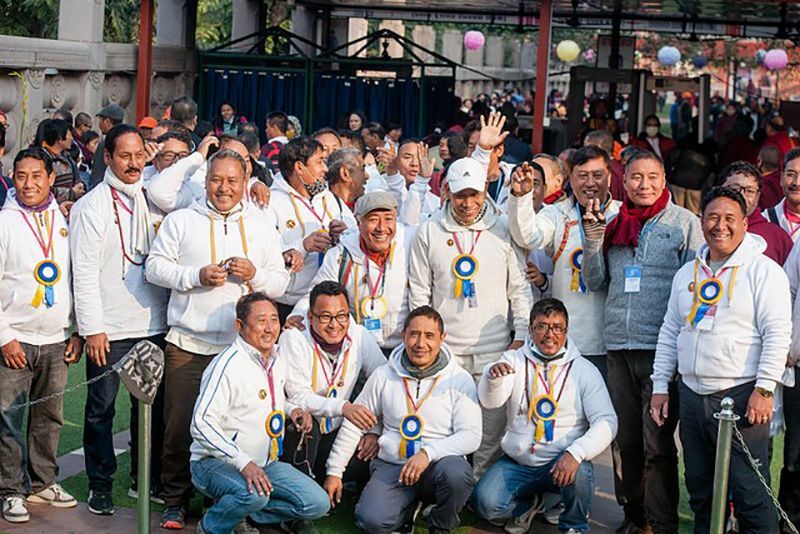 On the basis of understanding impermanence, the student can develop devotion within their being to the guru, which is the root of the practice of Guru Yoga, the complete practice which brings the blessings of all three roots. What is this devotion? It’s not simply an outward display of respect towards the guru, but rather a yearning for and the wish to develop the guru’s special qualities, and the commitment to practice his or her teachings one-pointedly. This devotion is a commitment from now until we achieve enlightenment. As the Kadampa masters say, we should never be separated from the guru’s body, the guru’s speech or the guru’s mind. Genuine devotion does not depend on circumstances such as the guru’s pleasure or displeasure with us. 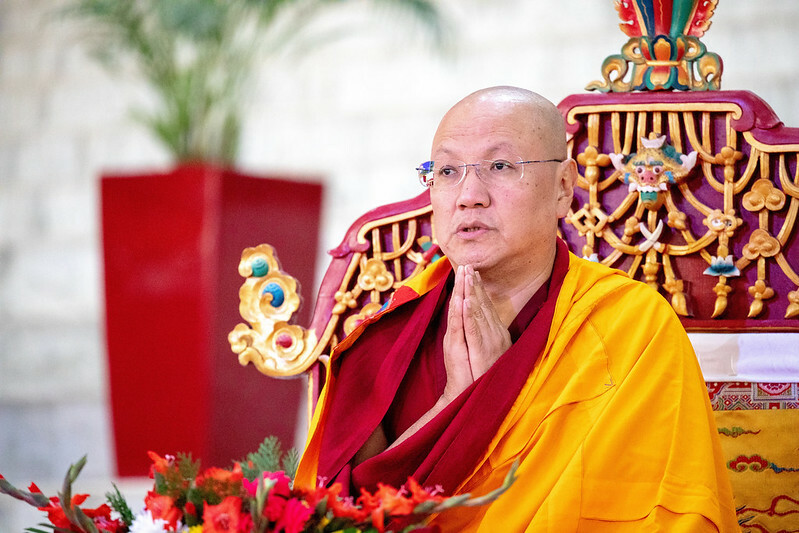 If a student can practise in this way, the adventitious stains which obscure the mind will definitely become thinner, Rinpoche assured everyone. Also, a student must be able to withstand adversity and bear suffering. The prime example of this in the Tibetan tradition is Jetsun Milarepa, who served Lord Marpa unflinchingly. It is the ability to use everything, whatever happens to us, as a means on the path to enlightenment, and throughout, practising with fortitude and service to the guru. The root of suffering is ego-clinging. Through accepting and confronting suffering, it can become meaningful, and we can purify misdeeds and gather the accumulations. When we understand cause and effect and the Four Noble Truths, when we wish for refuge from the suffering of samsara, we can request the refuge vows from the guru. In the first stanza, Tilopa calls his student ‘intelligent Naropa’. This is not intelligence in the way in which we ordinarily use the term. The word here means prajña, the intelligence to discern. Without discernment, dharma practice cannot be properly effective. Through prajña we will be able to manifest both seen (in this lifetime) and unseen (in future lifetimes) qualities. Through prajña we are able to understand what is good and what is bad and enter the Buddha’s teachings. We are able to examine what we need to give up and what we need to practise, and then, with conviction, we can engage in ethical conduct and samadhi. Just as who can show space to whom? Likewise, there’s nothing to show in the nature, mahāmudrā. Mahāmudrā is ineffable and inconceivable, it transcends language. It is neither an object of conceptualisation nor is it dualistic, so there is nothing to be described or demonstrated. There is nothing to be shown. Similarly, Prajñāpāramitā, the perfection of transcendent wisdom, is also beyond all extremes and beyond language. By cutting through external appearances, the projections of our own mind, we need to rest in the nature as we are. There is no need to look at external things to find the ultimate nature which is within us. 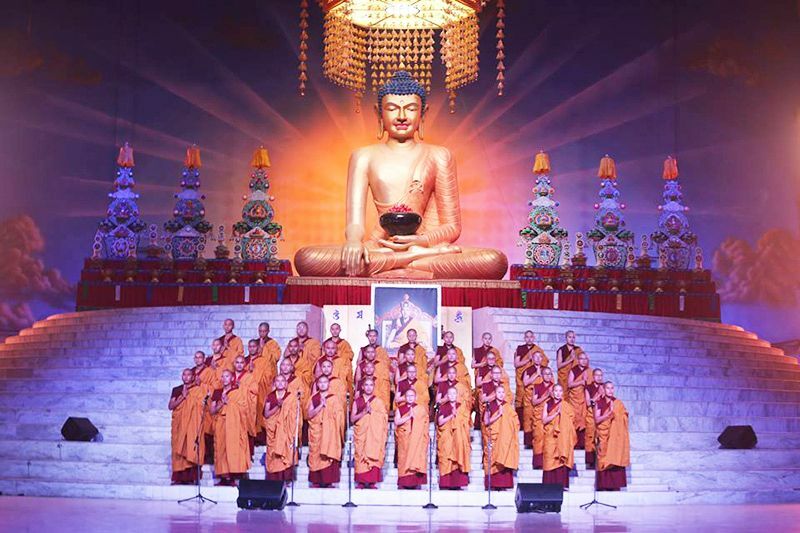 The words of the Buddha and scriptures are aids to realisation. Through meditation, we gain experience. Like waves in the ocean, our thoughts dissolve into the dharmakāya and arise out of the dharmakāya. When thoughts dissolve into the dharmakāya, this is known as uncontrived meditation. Usually, when the six consciousnesses engage with an external object, because of our dualistic thinking, we react with either attraction or dislike to that object, and this begins a chain of thoughts or actions which lead to the accumulation of karma. By realising the view of emptiness, we can stop this reaction, and eventually achieve the yogic conduct of the ‘single taste’. When we meditate, we should relax and rest in the unaltered nature. We should not block thoughts, whether good or bad, but neither should we chase after them. Relax and rest in the unaltered basic nature. Thus, in meditation, we should rest in the ‘unaltered basic nature’, the unproduced primordial state of luminous mind. ‘Relax’ means not to block thoughts. Instead, we use thoughts as an aid to our meditation and look at their essence. At the same time, we have to ‘rest’; let things be without altering anything, and leave them there. Having seen the nature of all phenomena and realising that they are empty, the meditator relaxes and rests, and thoughts are self-liberated in the dharmakāya. 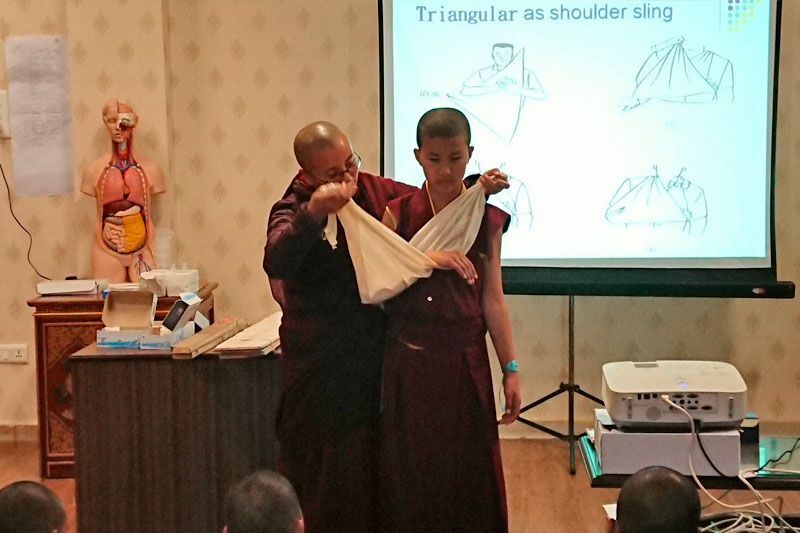 After the tea-break, Rinpoche’s teachings continued, focusing on how to practise. If the bonds are loosed, there’s no doubt you’ll be freed. The nature of our mind is the self-aware luminous wisdom, but we do not recognise it. Instead, because of our failure, we have tied ourselves up in delusion, grasping at things, ego-clinging and so forth. Though we claim to be meditators and practitioners, we are easily distracted from our Dharma practice. Whatever happens, whether good or bad, should not distract us but should be brought into our practice. This is a particular teaching of the Kadampa masters and of the mahāmudrā tradition which comes from Naropa. Gampopa taught the practice for a whole lifetime. In the Milarepa Guru Yoga we recite, “Bless me on this very seat,” but, Rinpoche admonished, “Where is that seat?” We have no time to sit. We spend the day wandering around rather than meditating. Milarepa’s final pith instruction to Gampopa was to show him the callouses on his buttocks, the product of intense meditation practice. We need to develop such fortitude and determination. If we say we are Kagyupa, we have committed to becoming like those great beings. Just talking about it is pointless: it has to be put into practice. We need to incorporate the mahāmudrā into our own beings so that when we die we can take death itself as part of the practice. It is also important to guard our conduct in body, speech and mind outside the meditation session so that we do not lose ourselves. We have to train in the path until there are no doubts, and this only comes from continuous training. We have to train to be undistracted in meditation, ‘in that fresh essence of thought’, as the Vajradhara Lineage Prayer says. Our aim should be to make all twenty-four hours of the day into yogic practice and cut through mistaken dualistic conceptions. I prostrate to my mother hell beings. I prostrate to my mother hungry ghosts. This might sound very strange, but a yogi understands that these are mere terms; it is looking at nature which is essential. Thoughts cease and unexcelled enlightenment is achieved. The question, Rinpoche commented, is how to maintain our practice, how to sustain the natural mind, and how to sustain letting things just be. The analogy here is looking into space, because when you look into space, there is nothing to see, no form, no colour, and so seeing stops. When ‘mind looks at mind’ refers to the mind in a state of equipoise, sustaining the ordinary mind unchanged. Ordinary mind is the nature of all sentient beings, inseparable from the buddha nature—there is nothing to remove or add, to lose or gain. When ‘thoughts cease’ means not that they disappear but that they are naturally liberated. These ‘thoughts’ are the ones we particularly grasp at such as things as truly existent or non-existent. Thoughts of themselves are not an obstruction; our fixation and attachment to them are. When the mind looks at mind, thoughts will be pacified and subside into the dharma nature. Thoughts continue to arise but we are no longer attached to them, and they are no longer an obstruction. They become an aid to our practice. Similarly, there is no difficulty when we have possessions if there is no attachment to them. Obstacles and adversity can also be aids to practice. The important thing is to be liberated within. In mahāmudrā practice, it is essential not to view our own mind negatively. So is it with the thoughts arising from your mind. Seeing your own mind purifies the waves of thought. In mahāmudrā, Rinpoche continued, we talk about stillness, motion and awareness of its nature. ‘Just as clouds of mist dissipate in the expanse of the sky ‘ refers to motion: just as clouds naturally dissipate into the expanse of the sky, similarly, when thoughts occur they are liberated into the Dharma expanse. The co-emergent mind essence is the dharmakāya; the unceasing appearances are the play of the dharmakāya. This mist ‘not going anywhere, not staying anywhere‘ is a metaphor for the thoughts which arise in our mind, whether virtuous, non-virtuous or neutral. If you see the nature of mind, you will not need to apply an antidote to eliminate them: the waves of thoughts will be self-purified and subside, like the waves in the ocean, into the nature of the mind. A doha by Saraha says: The mind, space, and the dharmatā, these three, are one in essence. They are inseparable, immutable, unaffected by conditions. Their separateness is just a projection of our mind and to claim that they are separate is mistaken and false. ‘Seeing your own mind purifies the waves of thought’. Like snow falling onto hot rocks, when we realise that thoughts are merely a display of the dharma nature, they are purified immediately. Consequently, by developing realisation in our mindstreams, the five afflictive thoughts [the five kleshas or mental afflictions: anger, attachment, ignorance, jealousy and pride] are cast out. It is unnecessary to use an antidote to transform them. This self-arising self-liberation is a very important point in the practices of both Mahāmudrā and Dzogchen, and makes it possible to practise anywhere and everywhere, whatever we are doing. Thus, the yogi has no need to distinguish between meditation and post-meditation. Further, when we realise the nature of self we can overcome dualistic thinking which divides experience into two opposing parts: self and others, going and coming, motion and stillness, samsara and nirvana, and so on.